Our Two Children-our real children--are teenagers now. So we decided we needed some one to look after then it became two someones to look after! They both look so happy. I love seeing this. They must have a loving family and that's great! 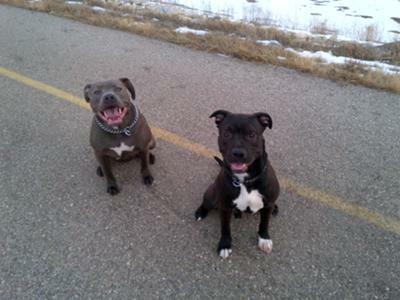 i love these 2 trouble makers with ALL my heart , not only are they family ..... these pittys are the glue that keeps us together :) NOTHING BETTER THEN A PITTY SMILE !!! a pitbulls smile to brighten my day.